We warmly invite all ladies to enjoy this beautiful course in the soft atmosphere of Mother Divine’s abode. Everyone is warmly invited to join; no previous art training is necessary. If you have already studied art and would like to deepen your knowledge and skills, you are also warmly invited to join this course. You will receive artwork assignments according to your skills as well as individual coaching. In addition to gaining theoretical knowledge of art and practical artwork, participants will enjoy group practice of the Transcendental Meditation and TM-Sidhi Programme. This course is taught in the light of Maharishi’s Science of Consciousness and includes beautiful video-recorded lectures of Maharishi speaking on art. At each step of learning, the key principles of art are connected to the development of higher states of consciousness. Enjoy delicious vegetarian meals with fresh organic milk, fruit, and vegetables. Room and board to be paid on arrival at reception (cash or credit card). 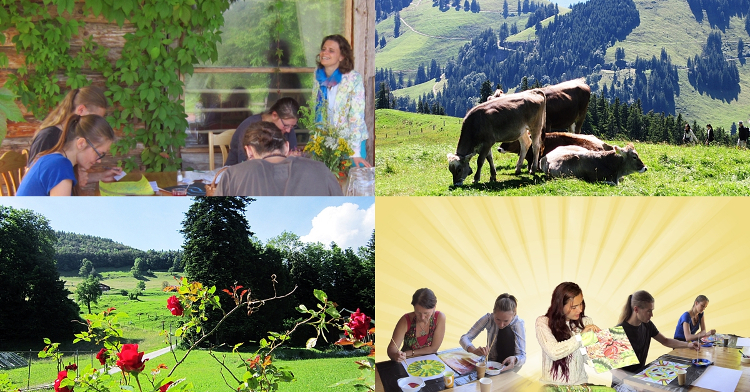 We are looking forward to welcoming you to our courses in Seelisberg. Copyright © 2018 Maharishi Vedic University Ltd. All rights reserved worldwide.